With GPSs and turn-by-turn directions literally at our fingertips, the art of reading and understanding a map is quickly becoming a thing of the past. However, there are certain situations where knowing how to read a map could be your only way out. When you're out backpacking or taking a hike through your local forest reserve, you’re not always guaranteed the great cellphone service or charged battery that would get you from point A to point B. Also, when you go off the beaten path, there sometimes aren’t detailed maps available on electronic GPS units. As long as you’re learning to read a map, you’ll also need to know how to read a compass. This tool has been used to determine North, South, East, and West since 200 B.C., and will still come in handy as you orientate yourself and set out to use your map. As far as map reading goes, there are 3 basic steps for you to learn. Ranger Mac will look over those 3 steps now and help you put them into practice next time you decide to visit the great outdoors! There are more varieties of maps than just the ones that you see on the spinning racks at your gas station counter. What you’re planning to doing will determine which type of map you need to be looking at and navigating from. Would a map of Disney World help you if you want to find the scenic loop of the Badlands? Probably not. Similarly, a map of elevations without roads won’t do much to help you find your friend’s new house. Topographic Maps - These show contours, usually indicated by circles that indicate land that's at the same elevation. On this kind of map, the top of a mountain would be shown as a small circle surrounded by bigger circles that don't overlap. Each subsequent circle shows a different elevation, decreasing from the top of the mountain. (A dip in elevation will also show as similar rings within rings.) These maps can show detailed terrain and can be very helpful to hikers. Physical Map – These show the features of a location, such as mountains, rivers, forests, etc. They are usually differentiated by color. General Road Map – These are great for road trips, should your GPS flake out or your cellphone run out of battery. They are extremely detailed, but you’ll need to make sure you use an up-to-date one, or else you might get sent in the wrong direction! Tourist Map - These reveal good attractions and interests around an area. Other – There are lots of other types of map, but many are more useful for the researcher or student than the traveler or hiker. For example, political maps show political boundaries such as states and countries, climatic maps show the different climates of a region, and economic and resource maps reveal information about the economies of a given area. Title - This tells you what area the map shows, or what the map contains in general. Legend - This gives you a description/guide of the different features and markings on the map. Grid References - Sometimes these are called orientation, and they show the coordinates included on a particular map. Maps are broken into grids, with the first 2 digits being the 'x value' (horizontal orientation) and the last 2 being the 'y value' (vertical orientation). North Arrow - This arrow will tell you which way is North on the map, and it will almost always point to the top of the page. Scale - This is how zoomed in your map is. It will probably either be on a scale of 1:50,000 or 1:25,000. This determines the amount of detail that can be on the map. The scale usually includes a short line that’s labeled with how many miles or kilometers are shown by that distance on the map. For example, if the scale indicates that 1 inch equals 1 mile, and the map is 10 inches long, it's shows an area 10 miles across. First, you will want to orient your map so that North is on top, and place your compass above the map, parallel to the ground. Now rotate yourself (and your map) until the compass needle is also pointing North. Now you’re ready to start exploring while using your map! The next step is to identify with your surroundings and relate them back to your map as best as you can. You usually will not know your exact grid reference to begin with, so it’s a good idea to start at a grid reference on the map that you do know. A good way to do this is to trace your steps at the start of the hike from a known location, such as the nearby town, and make sure that you’re in the correct general area. You can also make use of important landmarks. Look for major landscape features such as mountains or waterways or man-made features such as buildings or roadways. If you can easily identify 3 surrounding features around you, then locate them on your map, you can be confident that you have located yourself by comparing their relative locations to your point of view (this is called triangulation). You're now ready to go on your hike using the grid reference to help you navigate! Spurs - These are recognizable as feature that slope downwards on three sides and slope upward on one side. Re-Entrant - This is an indentation in the side of a mountain and can be seen on a map as contour lines pointing against the natural slope of the mountain. Saddle - These can be seen in real life as a feature that slopes down on two sides and up on two sides as well. Summit - This is the very top of the mountain and can be identified on a map by a 'ring contour,' a circle without any smaller circles within it. Based on the map you’re using, there will be different color schemes throughout, as well as different kinds of legends. 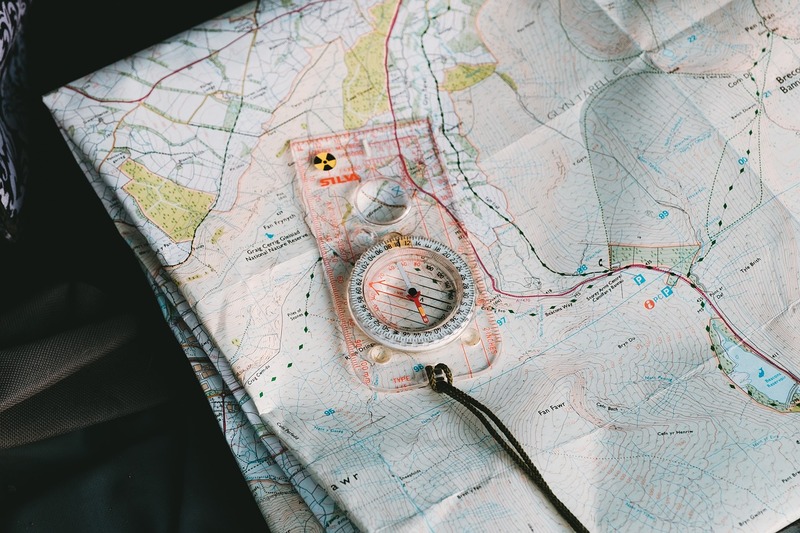 Once you have a basic understanding of a map and all it encompasses, you’ll be able to pick up any kind of map and use it to locate where you currently are and how to navigate to where you want to go! Now you just need to find a good place to hike. If you want an idea of where to go, why not check out Joshua Tree National Park?